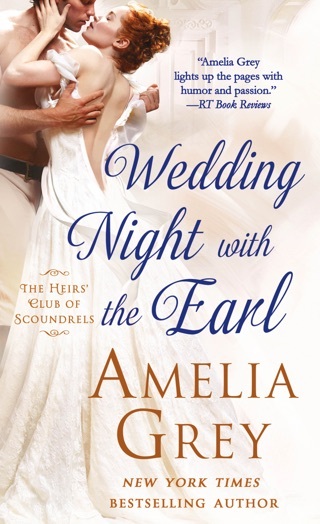 Regency romance by bestselling author Amelia Grey “grabs you by the heart, draws you in, and does not let go” (Romance Junkies). 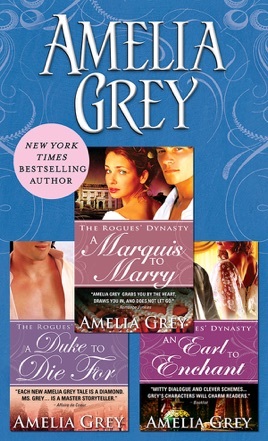 Now, get the Rogues’ Dynasty romance trilogy for one low price. Alexander Mitchell Raceworth, the dashing fourth Marquis of Raceworth, is shocked when the alluring young Duchess of Brookfield accuses him of stealing priceless pearls belonging to her family. Susannah is the most beautiful, enchanting woman he has ever met, but despite his attraction, he’s not about to hand over the pearls. Though suspicion and mistrust drive them apart when the pearls are stolen, Race suggests they pool their resources to recover them. If they do find them, will they finally be able to give in to love, or will the truth about the elusive necklace tear them apart once and for all? Lord Morgandale is as notorious as he is dashing, and he’s determined no woman will tie him down. But from the moment young Arianna Sweet appears on his doorstep, he cannot resist her fascinating personality and tempting green eyes. But Arianna has a deadly secret: she is in possession of her father’s groundbreaking discovery—one that someone would kill for. She can’t tell Lord Morgandale her secret, but she desperately needs his help. Can he save the lady without losing his heart?